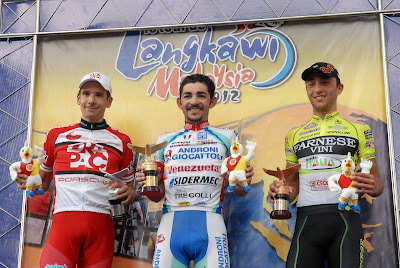 28 Feb 2012, PANDAN INDAH, AMPANG - Australian Darren Lapthorne jumped from third to first overall in the Tour de Langkawi today, riding superbly on the toughest stage thus far and grabbing hold of the yellow jersey. 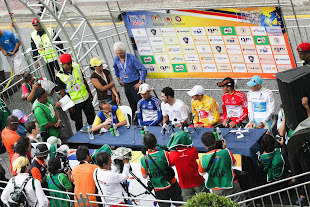 He finished just behind former race winner Jose Serpa (Androni Giocattoli – Venezuala) into Pandan Indah, with the duo completing today’s 190 kilometre race eleven seconds ahead of Matteo Rabottini (Farense Vini – Selle Italia) and four others. A bigger chase group came in 24 seconds back and contained most of the GC contenders, with the exception of overnight race leader Dave Zabriskie and Adam Phelan (Drapac Cycling). The former unexpectedly cracked after leading the race since last Friday, losing 19 minutes 35 seconds by the finish. As for the latter, he pulled out during the stage. Injuries sustained earlier in the race were stated to be the cause; the net effect was that Tom Danielson, who started the day fourth overall, jumped up to second. Alexandr Dyachenko (Astana Pro team) moved up to third, 46 seconds back, while the 2010 race winner Jose Rujano is now fourth. Lapthorne said that he knows he has a big fight on his hands to remain in yellow, but that he will give it his all to do so. 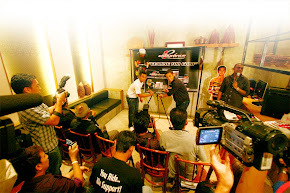 The rider who was up against him today is also determined to put in a big ride on tomorrow’s Genting Highlands climb. 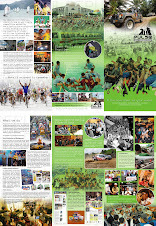 128 riders started the fifth stage of the race in Air Keroh, with warm, bright conditions contrasting with the heavy rainfall and overcast skies which preceded the previous stage. 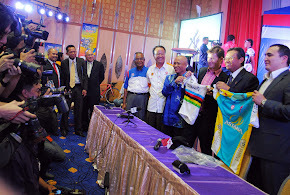 The route was the toughest yet in the 2012 Tour de Langkawi, with the category two climbs of Bukit Tangga (km 102) and Genting Perez (km 148.8) rearing up before the category three ascent of Bukit Tinjau, ten kilometres from the end of the stage. Immediately after the official start of racing, a break of five riders moved clear. 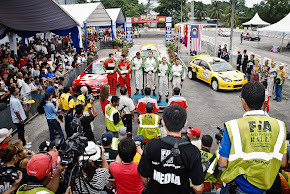 These included King of the Mountains Floris Goesinnen, Yasuharu Nakajima (Aisan Racing Team), Nicholas Francesco Squillari and Sea Keong Loh (OCBC Singapore) plus Ali Ahmad Fallanie (Malaysia). The bunch reacted to chase them down by kilometre five, splitting temporarily in the process. 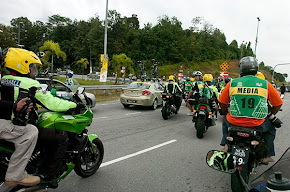 Further attacks followed by things were all together for the first intermediate sprint, that at Tampin (km 31.3). 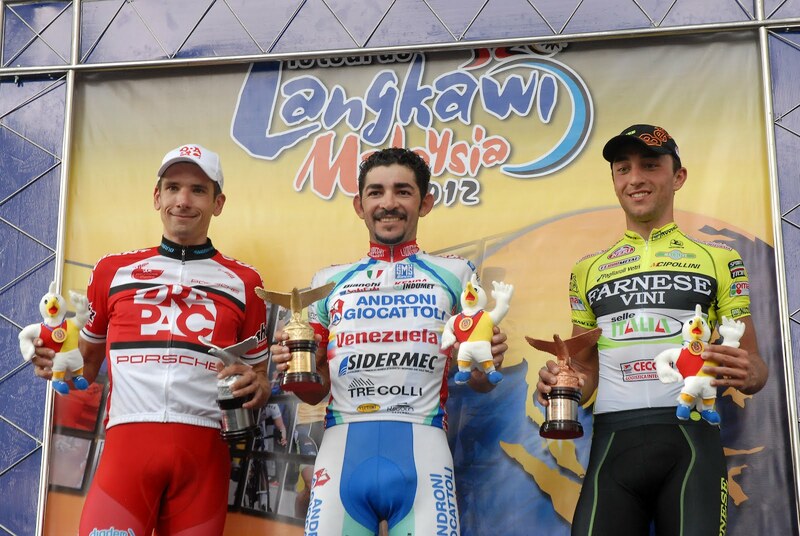 There, Salleh Harrif (Terengganu) beat Hassan Suhardi (Malaysia) and Matteo Rabottini (Farnese Vini Selle Italia) for the prime. The bunch split and reformed a couple of times, keeping the pressure on the riders. That pace ensured that 47.8 kilometres were covered in the first hour of racing, and also saw OCBC Singapore rider Marcus Leong and Drapac’s Adam Phelan withdraw. The latter had been sitting second overall, and so his retirement was of major importance. Salleh was triumphant again in the second intermediate sprint, finishing ahead of Jacobe Keough (United Healthcare) and Surhardi into Chembong (km 54.8). Soon after, a group of twelve went clear, with the number including mountains leader Goesinnen, yesterday’s breakaway rider Louis Crosby (New Zealand), former Vuelta a Espana stage winner Robert Forster (United Healthcare) and nine others. They were chased down by the Garmin team and things came back together just before the third intermediate gallop in Senawang, 75.7 kilometres after the start. There, Goesinnen beat Ghader Misbani (Tabriz Petrochemical team) and James Williamson (New Zealand). A more dangerous looking move clipped away very soon afterwards, and contained riders such as Asian favourite Alexandre Vinokourov (Astana), Goesinnen, Williamson, Mizbani Jose Serpa (Androni Giocattoli – Venezuela), Craig Lewis (Champion System), Alessandro De Marchi (Androni Giocattoli), Paolo Locatelli (Colnago - CSF Inox), Thomas Bertolini (Farnese Vini), Anthony Charteau, Yohann Gene (Europcar), Joseph Cooper (New Zealand), Karl Menzies (UnitedHealthcare) and Rhy Pollock (Drapac). They had established a lead of twenty seconds by kilometre 83, but split into a smaller quartet of Gene, Pollock, Williamson and De Marchi soon afterwards. 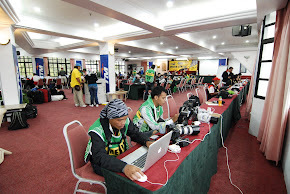 The others were recaptured while those four persisted and had a gap of just under four minutes when they started the first of the day’s two categorized climbs, Bukit Tangga. Williamson was first to the top there, ahead of Pollock, De Marci and Gene. He was concerned by the time gap drop to one minute and pushed on ahead alone, extending his lead to one minute 40 seconds over chaser Shinichi Fukushima (Terengganu). His three former breakaway companions were sandwiched inbetween the two individuals and regained contact with Williamson approximately 115 kilometres into the stage. Fukushima kept chasing and finally succeeded in bridging at kilometre 132. However it was all in vain, as the peloton got back up to them ten kilometes later, on the slopes of Gening Perez. Race leader Dave Zabriskie blew up on the ascent and lost his grip on the yellow jersey. 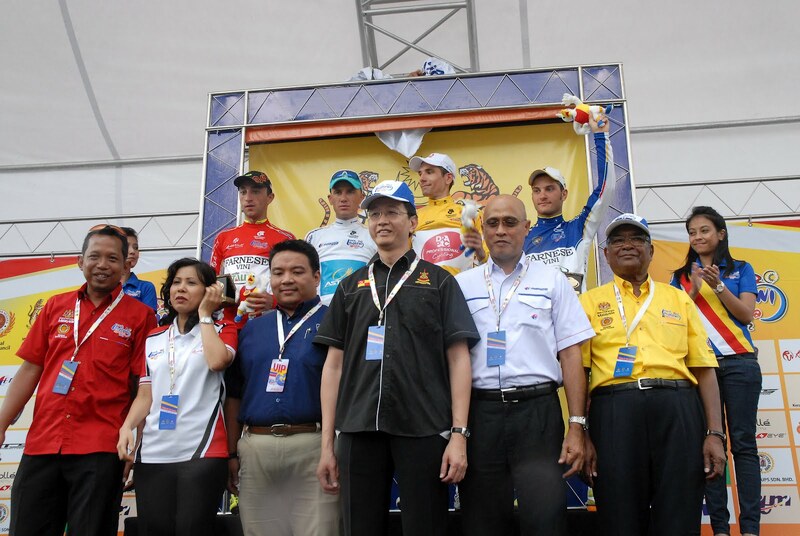 Meanwhile Matteo Rabottini was first to the summit of the climb, taking maximum KOH points ahead of Adiq Othman (Champion System), Jose Rujano (Androni Giocattoli – Venezuela) and Chan Jae Jang (Terengganu Cycling Team). 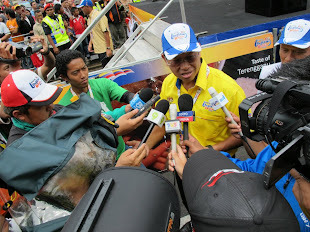 On the descent of the climb, Malaysian sprinter Anuar Manan (Champion Systems) crashed. Fortunately his injuries were not serious and he was able to continue on to the finish. 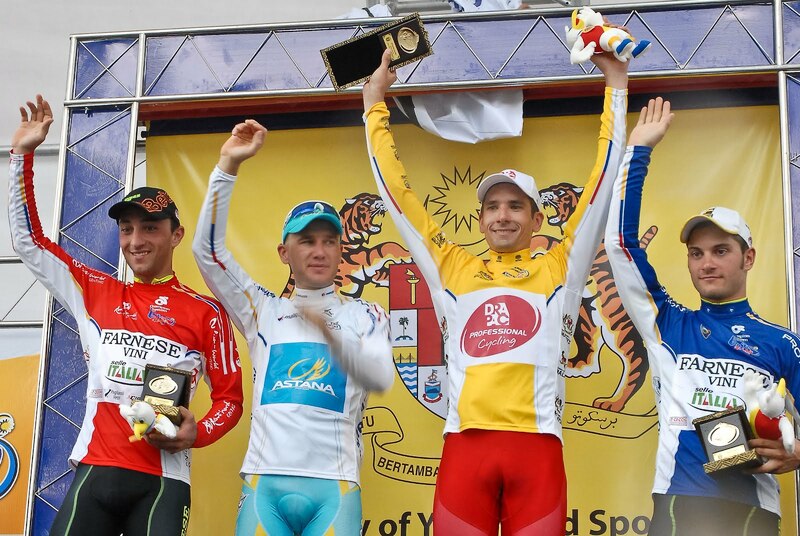 Meanwhile last year’s race winner Yonnatha Monsalve (Androni Giocattoli – Venezuela), Adiqu Othman, Rabottini and Andrey Zeits (Astana) clipped away and had established a 38 second lead over lone chaser Michael Torckler (New Zealand) with 25 kilometres to go. 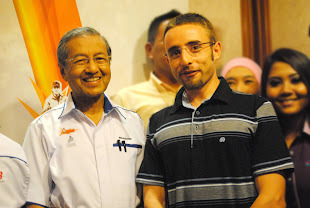 There was a further reshuffle after the day’s final climb, with Serpa, Rabottini, Mizbani, Darren Lapthorne (Drapac Cycling), Alexsandr Dyachenko (Astana Pro Team), Mohammad Saufi Mat Senan (Terengganu Cycling Team), Othman and Victor Nino Corridor (Azad University) pushing ahead. Lapthorne then attacked from this group with five kilometres to go, holding a solo lead until Serpa bridged across with one kilometre remaining. The latter proved quickest in the dash for the line, but the Australian rider also secured a place atop the podium through taking over the race lead. 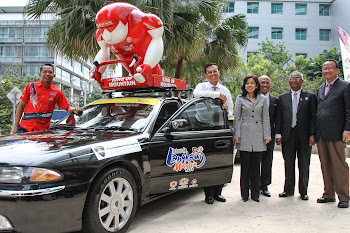 Tomorrows stage to the top of Genting Highlands is likely to be the big decider of the race.